Wall Street is warning its clients that commodity prices have disconnected from reality. The big global banks have begun to warn clients that the blistering rally in oil and industrial commodities in recent weeks has run far ahead of economic reality, raising the risk of a fresh slump in prices over the summer. Barclays, Morgan Stanley and Deutsche Bank have all issued reports advising investors to tread carefully as energy and base metals fall prey to unstable speculative flows in the derivatives markets. Oil has jumped 40pc since January even as the US, China and the world economy as a whole have been sputtering, falling far short of expectations. “Watch out: this rally may not last. The risks for a reversal in recent commodity price trends are growing,” said analysts at Barclays. Miswin Mahesh, the bank’s oil strategist, said a glut of excess oil is emerging in the mid-Atlantic, with inventories rising at a rate of 1m barrels a day. Angola and Nigeria are sitting on 80m barrels of unsold crude and excess cargoes are building up in the North Sea and the Mediterranean. Morgan Stanley echoed the concerns, warning that speculators and financial investors have taken out a record number of “long” positions on Brent crude on the futures markets even though the world economy keeps falling short of expectations. “We have growing concerns about crude fundamentals in the second half of 2015 and 2016,” it said. Shale producers in the US are taking advantage of the artificial surge in prices to hedge a large part of their future output, more or less guaranteeing that the US will continue to pump 10m b/d and wage a war of attrition against high-cost producers in the rest of the world. A comparable dynamic is playing out in the copper market, where net long positions have jumped 60pc since the start of the year and helped power the longest rally in copper prices since 2005, even as industrial output grinds to a halt in China. The warnings come as a draft report from OPEC painted a gloomy picture of energy industry, predicting that oil wouldn’t touch $100 in the next 10 years. The mini-boom in energy and metals has taken on huge significance since it is being taken as evidence that global recovery is under way and that the dangers of a deflationary spiral have abated. Barclays said that this in turn is a key factor driving up global bond yields, and therefore in repricing the cost of global credit. If the commodity rally is being driven by investor exuberance in the derivatives markets – rather than a genuine recovery in the world economy – it is likely to short-circuit before long and could even lead to a relapse into deflation. It is extremely difficult for central banks to navigate these choppy waters, raising the risk of a policy mistake. Fresh data suggest that the US economy may have contracted in the first quarter, and is currently growing at a rate of just 0.8pc, below the US Federal Reserve’s stall speed indicator. Deutsche Bank has also warned that the energy rally is showing “signs of fatigue”, with near-record inventories in the US, and little likelihood of further stimulus from central banks at this stage to keep the game going. “We see fresh downside risks to crude oil prices heading into the summer,” it said. Durable oil rallies are typically driven by OPEC cuts but this time the cartel has boosted supply by 500,000 b/d to 31m as Saudi Arabia tries to drive marginal drillers out of business across the world. 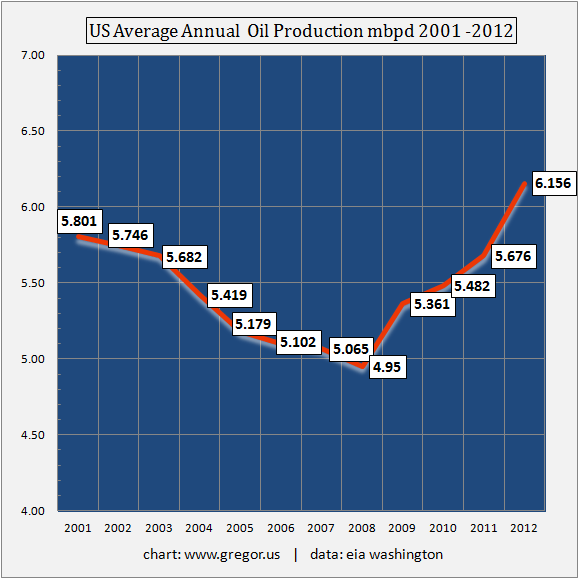 Contrary to expectations, America’s shale producers have yet to capitulate. The rig count has fallen by more than half but output has held up longer than expected. While a few drillers have gone bankrupt, others are already signalling plans to crank up production. Houston-based EOG said it expects to boost output in the third quarter at the Eagle Ford basin in Texas, benefiting from dramatic gains in technology that are cutting shale costs at an astonishing speed. Devon Energy has raised its growth target to 25pc to 35pc this year, having cut its production costs by a fifth in the first quarter. Tactical stockpiling of crude oil by China and other countries has masked the scale of oversupply but oil analysts say this effect may be fading. The deep economic slowdown in resource-hungry emerging markets has snuffed out the commodity supercycle. There is little sign yet of a durable rebound. China is still slowing as President Xi Jinping deliberately engineers a deflation of the country’s investment bubble. A series of cuts in the reserve requirement ratio and interest rates – including a 25pc reduction over the weekend – merely offsets “passive tightening” caused by capital outflows and rising real borrowing costs. It is not yet a return to ‘”stimulus as usual”. Not everybody is willing to throw in the towel on crude oil. Michael Wittner, from Societe Generale, said US output will decline in the coming months as the delayed effects of lower investment start to bite, ultimately vindicating the Saudi’s shock strategy of flooding the market. 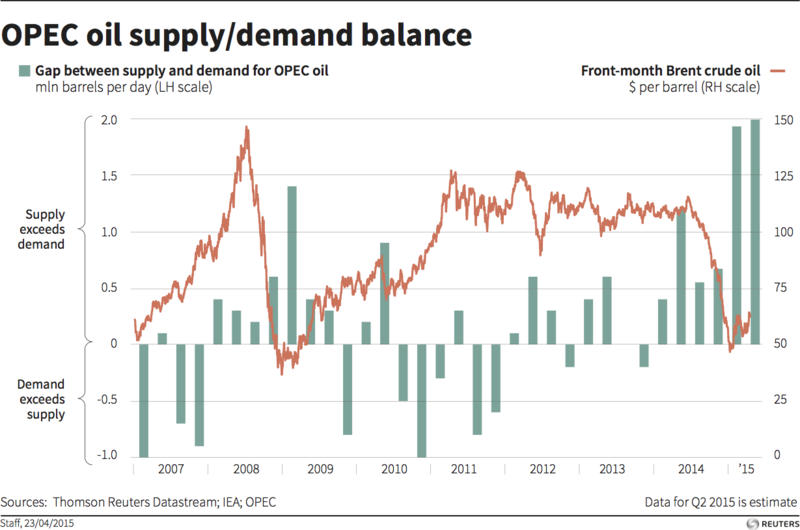 Crude stockpiles tend to build up from March to May. This is the “window of greatest vulnerability for a crude price correction”, Mr Wittner said. That window will be closing within weeks. Comments Off on Wall Street is warning its clients that commodity prices have disconnected from reality. Enbridge Inc., announced that it will build, own and operate a crude oil pipeline in the Gulf of Mexico to connect the proposed Heidelberg development, operated by Anadarko Petroleum Corporation, to an existing third-party pipeline system. The lateral pipeline is expected to be operational by 2016. Construction of the pipeline is subject to finalization of definitive agreements and sanction of the development by Anadarko and its project co-owners. The Heidelberg lateral will originate in Green Canyon Block 860, approximately 200 miles southwest of New Orleans and in 5300 feet of water. The pipeline will be 20 inches in diameter and approximately 34 miles in length. Enbridge’s offshore pipelines transport approximately 40 per cent of the natural gas produced in the deepwater Gulf of Mexico. The company’s offshore assets include interests in 13 natural gas gathering and transmission pipelines and one crude oil pipeline in five major pipeline corridors off the coasts of Louisiana and Mississippi. Subsea World News – Enbridge to Build Crude Oil Pipeline in US GoM. The U.S. shale boom has driven the cost of Gulf Coast light, sweet oil to its lowest level versus Brent crude in almost a quarter century as the nation’s dependence on foreign supplies wanes. Light Louisiana Sweet, the benchmark grade for the Gulf Coast known as LLS, has traded on the spot market at an average of 15 cents a barrel more than Brent this year, the smallest premium since at least 1988, data compiled by Bloomberg show. The spread’s highest annual average was $4.02 in 2008. The drop has cut costs for refiners in Texas and Louisiana accounting for 45 percent of U.S. capacity and replaced competing shipments from Africa. Gulf imports of light, sweet crude have fallen 56 percent since 2010, according to U.S. Energy Department data. A shale-oil influx from the Eagle Ford formation in Texas and Bakken in North Dakota and new ways to bring crude to the Gulf, such as this year’s reversal of the Seaway pipeline, may accelerate the shift. Light Louisiana Sweet, a grade prized because its low- sulfur content and density make it easier to process into fuels such as gasoline, was 92 cents cheaper than Brent yesterday. It averaged 20 cents less than the benchmark in the third quarter. Brent oil for October settlement rose 40 cents, or 0.4 percent, to $113.49 a barrel yesterday on the London-based ICE Futures Europe exchange. The contract advanced as much as 0.5 percent to $114.05 in trading today. U.S. oil output surged to the highest level in 13 years in July, according to weekly Energy Department data. The U.S. met 83 percent of its energy demand from domestic sources in the first five months of this year and is heading for the highest annual level since 1991, department figures compiled by Bloomberg show. Houston, New Orleans and other ports along the Gulf Coast accepted about 554,000 barrels a day of light, sweet oil from outside the U.S. in June, down from 964,000 barrels a day in June 2011 and about 1.25 million in June 2010, according to the Energy Department’s Energy Information Administration. The West African nations of Nigeria, Angola, Gabon and Equatorial Guinea accounted for 58 percent of the light, sweet crude imported into Gulf Coast ports in June 2012. North African nations accounted for a further 30 percent. LLS will become about $5 a barrel cheaper than Brent during the next 12 months, David Pursell, a Houston-based managing director for Tudor, Pickering, Holt & Co., said in a telephone interview. The discount would take into account the extra cost of getting LLS to other customers, such as refiners on the East Coast, Pursell said. Like oil in the Midcontinent, the relationship between LLS and Brent has been upended by surging shale production. West Texas Intermediate oil at Cushing, Oklahoma, the U.S. benchmark grade traded on the New York Mercantile Exchange, shifted to a discount to Brent almost two years ago after trading at a premium for decades. Cushing inventories surged to 47.8 million barrels in June, the highest level since Energy Department records for the hub began in 2004. The WTI-Brent spread reached a record $27.88 in October. It was at $18.03 a barrel today. Enbridge Inc. (ENB) and Enterprise Products Partners LP (EPD) reversed the flow of crude on the Seaway pipeline on May 19. The link, carrying as much as 150,000 barrels a day from Cushing to Gulf Coast refineries, is scheduled to pump as much as 400,000 barrels a day early next year. 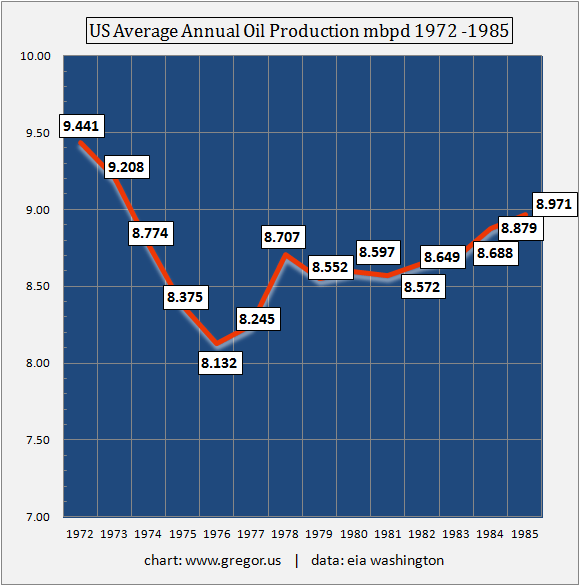 Coming out of the 1976 low, at 8.136 mbpd, US production rebounded over the following 9 years by 800 kbpd–not quite a million barrels per day. However, a volume comparable to the current rebound. Afterwards, the 40 year decline in US production resumed its decline. The course of US production into 2020 will be more dependent than usual on price. An increasing portion of total global production is crowded into the marginal price band of $80-$100 a barrel, and yet the world economy appears to struggle–on the demand side–at that very same level. Thus, new marginal production in the US and elsewhere is fated to continually pass back and forth, in and out of the domain of economic viability, as the world economy chokes, recovers, and chokes on high oil prices.